A.J. 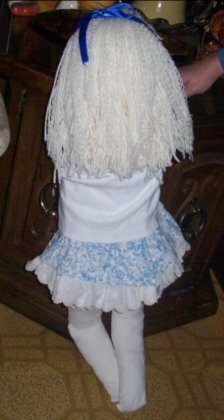 completed her Sweet Cindy named "Tabatha". 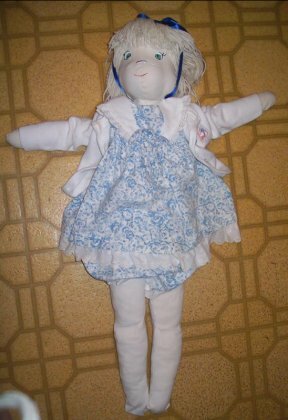 As far as I know, she is the youngest crafter who completed Sweet Cindy. 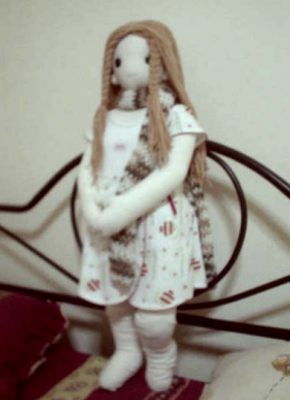 I am 14 years old and i found your website by browsing on Google for a life like doll pattern. 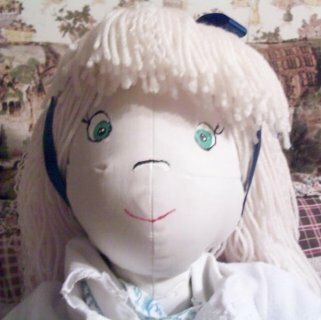 My grandmother, and my mother helped me make your sweet Cindy doll. 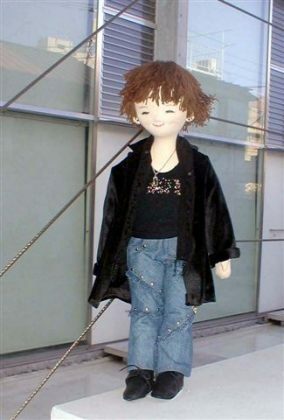 it took us about three days to complete the whole doll. I believe that the hair was the most difficult thing to do. 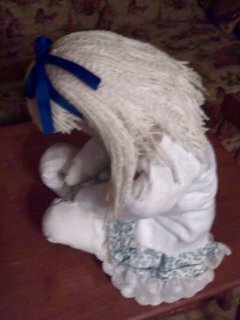 I named my doll Tabatha. She has yarn hair, and a painted face. My mother suggested me to put my own baby clothes on her. They fit perfectly. 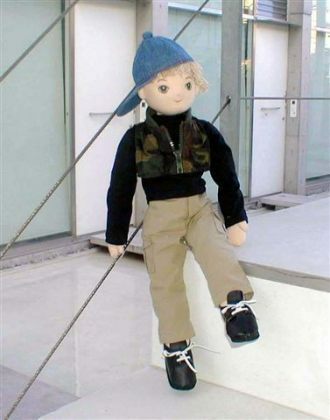 I cannot thank you enough for supplying your pattern, its the most life like home-made doll I have ever seen!! Paaien sewed elder Sweet Cindy. Her height is 41 inches (117cm). So she can wear Ready-made clothes. 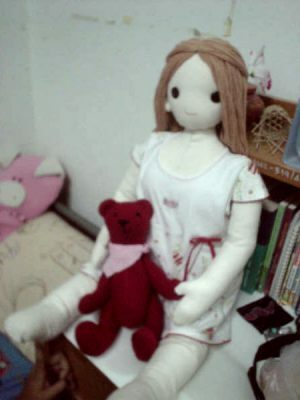 She looks a caring and gentle eldest daughter of Cindy dolls. My intention was to have Yuko a little older. At 130% enlargement, she is a North American size 10 - 12. The body is a little more full than I had intended but she is of realistic proportion. I found that using a nylon nut, bolt and washers in the arm joint works well but would suggest using grommets to reinforce the cloth at the joint. This project was completed with the Sweet Cindy patterns with minor adjustments. 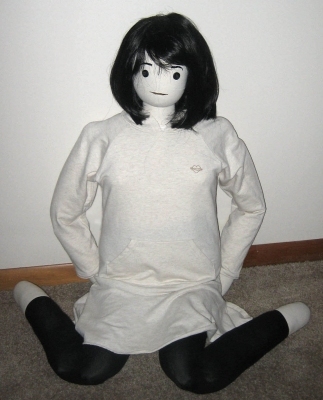 I have dressed her in purchased clothing and a synthetic costume wig brings a nice touch. Alphi's work She made a lot of wonderful dolls which based on her skill of making French doll, applying Sweet Cindy's pattern. The wonderfulness of the dolls exceeds original Sweet Cindy. These dolls are helf as tall as Sweet Cindy. 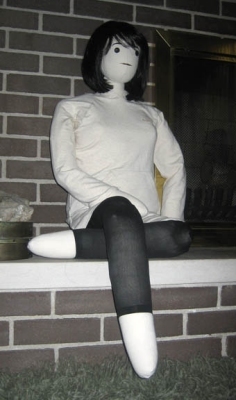 Since their body and head are covered by one piece fabric, having smooth surface from face to neck and body. So they can wear a low-cut shirt finely. To wear various clothes finely, it is better to stuff firmly. 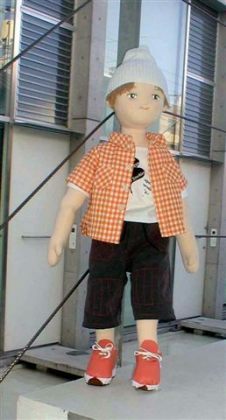 His name is "Daichan". I sewed his hip joint with similar way as Teddy bear. He is about 18 inch height. 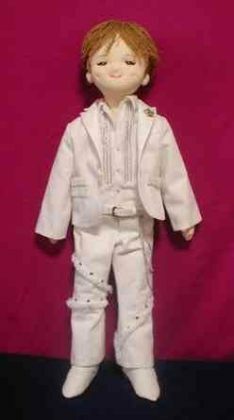 �@They are are much-awaited boy dolls based on Sweet cindy's pattern. 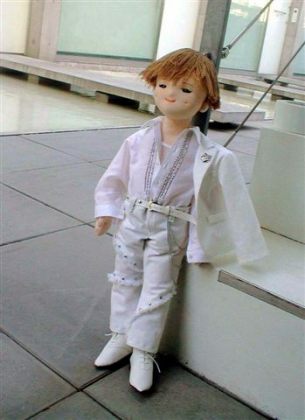 Aruhi releases pattern for these dolls. 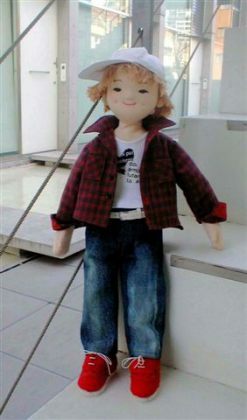 They are much-awaited pattern for boy dolls based on Sweet Cindy technology. 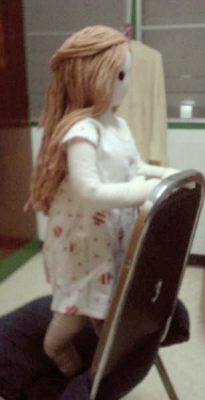 Noonie sewed her Sweet Cindy named "Nam-tarn" without sewing machine except her wig only in two weeks. "Nam-turn" means "sugar" in Thai. I think she has soft feeling and affectionate looks. 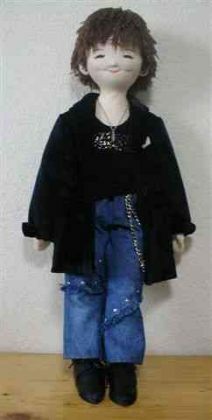 If you like, Please send pictures of your Sweet Cindy or pictures of a doll using Sweet Cindy's methods for this page. Please write the contents of the following list with pictures. If you like, you can place a link to this page. Use button picture below. The "DOKU" does not mean a doctor. "DOKU" originates in the Japanese word "DOKUTOKU", and it means unique and original.